Christine Lagarde, the head of the International Monetary Fund (IMF), is urging African nations to do more to prevent conflict, which stands in the way of economic and political stability on the continent. In an address to leaders in Abidjan, the capital of the Ivory Coast, Lagarde said that security was fragile in West Africa. “Without the promise of peace, people will not have the courage to invest in their own futures. Conflict wreaks widespread economic havoc – not only in the country in question, but across neighboring countries too,” she said last week. “It is the true enemy of development,” she added. In neighbouring Mali, French forces were fighting Al-Qaeda affiliated militants who had seized control of the north after a military coup and were trying to push southward. Lagarde pointed to a window of opportunity for concrete economic growth in Africa. She quoted IMF figures that projected 5.25 per cent growth for sub-Saharan Africa in 2013, the second highest in the world. Four of the globe’s 10 fastest-growing economies are in Africa, fueled partly by growing Chinese large-scale investments in areas such as infrastructure and telecommunications. A joint report from the World Bank and the African Development Bank indicates that rapid modernisation and upgrading of information infrastructures in the past five years has enabled the number of cellular subscribers to reach 650 million in 2012. 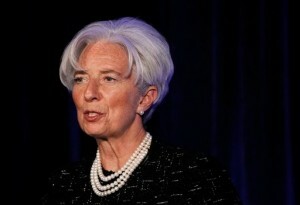 “It’s clear that emerging countries are the motor of world economic growth,” Lagarde said.